below in text. Enjoy your visit. Paxymer is designed for safe burning behavior in contrast to conventional solutions that have focused solely on self-extinguishing behavior. Safe burning behavior includes low smoke emission, low-toxicity smoke, non-dripping and low heat-release rate. Products are normally certified upon final application, regardless of certifications attained on the material. Product design, geometry and final composition of additives, base materials and colors will all affect the burning behavior of the material. The relationship between different standards is an oft-misunderstood aspect. For instance, testing for UL94 will give you little or no information regarding how the product will behave in a Euroclass test. Testing the material with a standardized test specimen will not indicate how the final product will behave in the final construction. We recommend you test for the specific standard and for full formulation directly in the application, whenever possible. The most well known burning standard. Sample sizes are standardized and oriented horizontally or vertically. The standard contains several different fire classes. Vertical orientation. 2 ignitions 10 seconds each with a 50W flame. Time to extinguish and dripping properties determine rating. Thickness of the sample is also specified. Horizontal orientation. 1 ignition with a 50W flame. Burning speed is calculated. Dripping is not considered. Horizontal and vertical burn of plaque and bar samples. 5 ignitions with 500W flame. Rating determined by time to extinguish, dripping behavior and burn-through of the material. German building standard. Classifications are DIN4102 B1 and B2. It measures dripping, smoke and burning time of the material when exposed to a heat source. Will be integrated under the so called Euroclasses or EN13501. Also known as Euroclass certification. A new European standard with grades A-E. On this scale A is classified as non-burnable material. B-E have different testing standards connected to them. Heat release, extinguishing, dripping and smoke release are evaluated. Applied to building products. Also contains specific classifications for flooring and other special applications. Cone calorimetry testing used in a number of standards and for research purposes. Heat release rate and some other parameters are measured. Often used for indicative testing. The International Maritime Organisation (IMO) uses this standard as one component in their fire evaluations. Measures smoke toxicity. HCl, HF and HCN as well as toxicity with regard to NOx, SOx, CO and CO2 levels. Other standards also measure HBr levels. A smoke density test. The opacity of the smoke is measured by burning a specified amount of material in a 3x3m chamber. Commonly used for Electrical and electronic equipment. Thickness of goods and temperature is specified. Examples of pipe burn-tests made on the final application rigid pipes in PP with Paxymer MB702. 60s flame application with 1kW flame (EN-50085). Paxymer has extensive experience with a wide variety of standards. We are happy to assist you in evaluations and dosage recommendations. One of the main challenges when working with flame retardants is retaining mechanical and processing properties. Incompatible additives cause problems with impact and elongation values. Another common issue is deterioration of ageing properties. Producing Paxymer compound according to customer specifications. 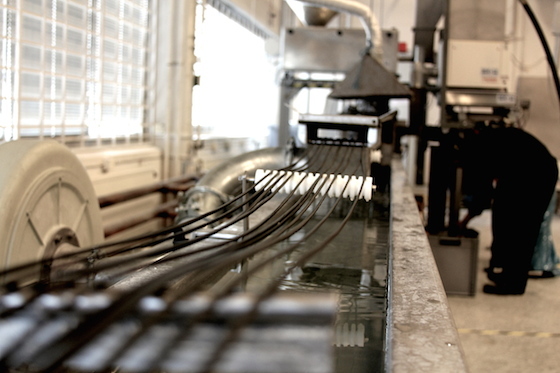 At Paxymer we use functional polymers that have good compatibility with the base materials, a unique approach that results in a low impact on mechanical properties and excellent processing properties. Click here for further technical data on Paxymer. The processability of conventional halogen-free flame-retardants is still one of the main challenges. Good dispersion is critical in order to maintain mechanical properties and achieve good burning performance. Paxymer’s master batches are easily dispersed and can be used by converters and compounders alike. The current development of the market shows a clear trend towards greener solutions and elimination of persistent and toxic alternatives. This change is driven by stricter legislation, standards and OEM policy. The Stockholm, Basel and Rotterdam conventions – all part of the United Nations Environment Programme (UNEP) – are coordinated to achieve a holistic and stringent chemical legislation in the 186 member states. POPs: Persistent Organic Pollutants are and have been a main focus area for prohibitive legislation. PBT: Persistent, Bio-accumulating and Toxic substances are requirements posted by ECHA for banning substances in the EU. CMR: Carcinogenic, Mutagenic and Repro-toxic chemicals have been much debated and are also under scrutiny. EDC: Endocrine Disrupting Chemicals are also the subject of intense debate with several agencies pushing for restrictions on the use of chemicals with these characteristics. Standards are evolving towards increasing levels of product safety. Standards consider overall impact of materials on the environment. Plastics are evaluated according to stringent safety criteria for burning behavior as well as according to environmental and health criteria for emissions and overall toxicity. Demands for disclosure of material composition are also increasingly common. Burning standards such as EN-13501, EN-61386, EN-5660 address burning behavior and are based on risk assessment methodology. These standards normally include analysis of emissions of toxic smoke from burning material. Green building certifications and similar aggregated frameworks are being used for evaluation of other criteria such as persistence, toxicity and emissions from materials. Materials containing halogens, such as brominated and chlorinated flame retardants or PVC will not normally pass these tests due to their release of toxic smoke and persistent characteristics. Paxymer is designed to meet criteria for heat release rate, heat stabilization of material, smoke and dripping as well as persistence and toxicity requirements. The figure shows a schematic over the normal steps in an implementation process. Steps 2-3 will normally be iterated until results are satisfactory and evaluations can be scaled up. Once the correct Paxymer products has been selected steps 1 through 3 can normally be completed during a half or one day trial depending on the process. 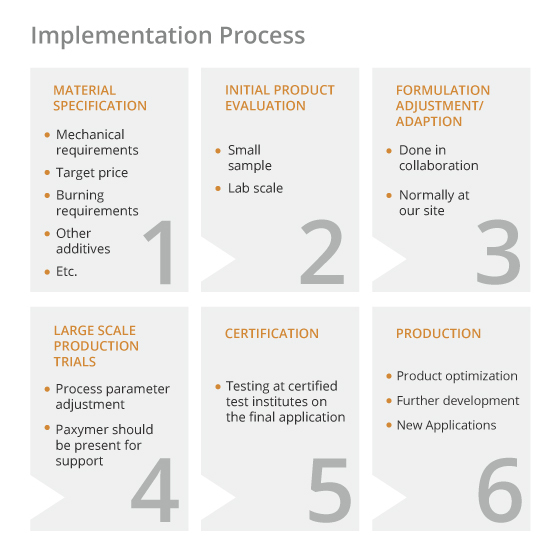 The total implementation process can be completed very quickly depending on what additional requirements and tests the products has to fulfill.